I publish the text of the talk I gave on November 20th at the Royal College of Nursing in London for the event Emotional Objects: From Lost Amulets to Found Photos, organised by the Centre for the History of Emotions of Queen Mary University within the Human Being Festival 2017. With this talk, I hope I can suggest a standpoint on the literary work of the Italian contemporary writer Michele Mari by showing how his writing is consistently focused on the relation between memories and objects. In his last book, Leggenda privata, an autobiography disguised as a horror story (but also the other way round: a horror story disguised as an autobiography), published a few months ago, he writes: «All my books are about the soul entrusted to things». 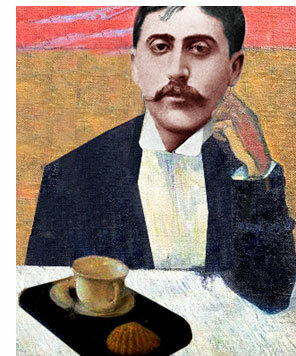 Before going into Mari’s emotional fetishism, though, I want to introduce another outstanding fetishist, Marcel Proust. I assume few people in the world, even among literary scholars, have read the thousands of pages of Marcel Proust’s Remembrance of Things Past entirely. But I’m pretty sure a fairly larger number of people know the most famous scene of the novel, whose main character is a traditional shell-shaped French cake, the madeleine.